The 2010 Blastoff Trap is a Limited Edition Tactical type weapon. It's time to welcome in the new year! Lying in wait behind this colorful pile of fireworks is a diligent little droid, waiting to make the first catch of 2010. When a mouse takes the bait, the droid pushes the plunger, and in a blinding flash of light and color the mouse sails up into the stratosphere, tied to a colossal rocket by the rope around his foot. The mouse can use the banner as a parachute, if he's smart, but that all depends on whether or not the banner catches fire during launch. The 2010 Blastoff Trap is a Limited Edition weapon and can no longer be acquired by Hunters. It was available to purchase from Ronza's Traveling Shoppe during The Great Winter Hunt '09. It cost 512,800 gold and could be refunded for 92,304 gold at the same location. 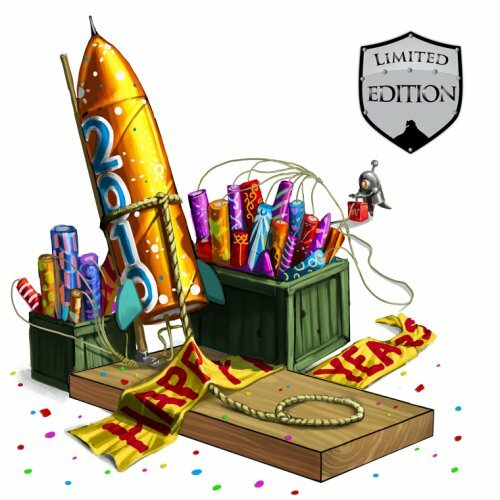 23 December 2009: The 2010 Blastoff Trap was introduced, but not able to be purchased. 30 December 2009:' The 2010 Blastoff Trap became available for purchase.